Welcome to the Bureau of Alcohol, Tobacco, Firearms and Explosives (ATF) Washington Field Division. Our Division is responsible for ATF criminal enforcement and industry regulatory activities in the District of Columbia, the Commonwealth of Virginia, and seven counties in the panhandle of West Virginia. Our dedicated work force is comprised of special agents, investigators, auditors, technicians and support staff. Read more about the Washington Field Division. 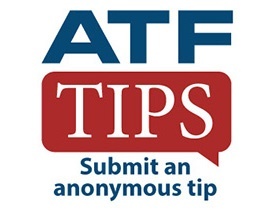 Text the code ATFWAS to 63975 and then follow the link to create a report. August 1, 2018 - Officials Across the Country Fear a New Era of Untraceable Firearms - Online gun kits include nearly assembled firearms and the tools to finish the job. Police say they're seeing more and more of these "ghost guns". Read the full story.